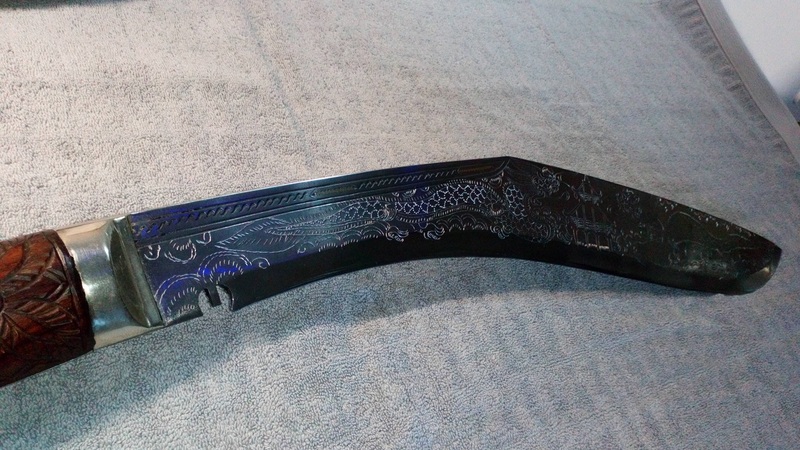 Dragon:: All kukris that belong under the carved dragon category are engraved with the picture of dragon on the blade. 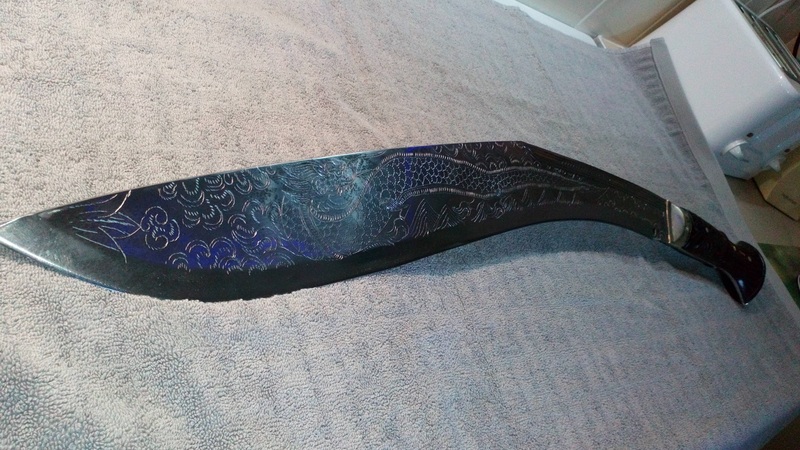 The engraving is done on both sides to beautify the look of the blade and also to show the craftsmanship of the engraver. The craftsmen who particularly belongs to the “Newars” community of Kathmandu have ancient ties with carving and making sculpture. Newars are the most artistic group among others in Nepali community. There is no significant importance in carving dragon on the blade, it is done simply to comply with the elongated shape of the kukri blade. The carvings are done by hand using only basic tools. 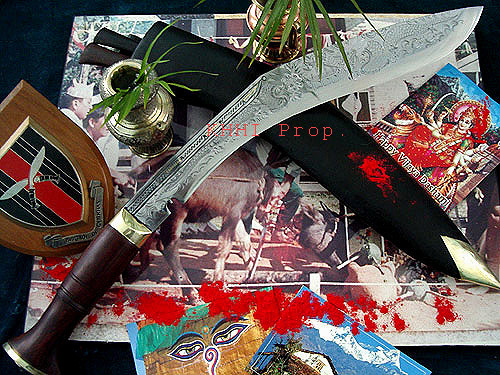 Khukuri: This is a large type of kukri used for sacrificing animals in festivals. “Dashain”, the main festival of Nepalese, which mostly falls in October is celebrated by sacrificing animals (buffaloes/goats) after necessary rituals are done on the 9th day called “Maar” during the 10th day long festival. It is a customary in Nepal that families celebrate the festival by purchasing domestic animal from locals and sacrificing it at home or mostly at temples as an offering to the goddess “Durgamata”. There is also a myth that the whole community where the ceremony is performed will suffer misfortune if the beheading is not done in one clean stroke. All the forging and making of the knife is done by hand using only conventional domestic tools. It takes three men one whole day to finish this kukri. Historically speaking, 18” khukuri was primarily made for religious ceremonies and also as a no.1 combat khukuri for the soldiers. It was also made for the honorary and distinguished people to mark a deed or one’s position. The khukuri is believed to have existed centuries back but was only realized during the Gorkha campaign of uniting Nepal as one big country in mid 1700’s. The battles witnessed excessive use of large khukuris by Gorkhalis (Gorkha Army) which has also been documented and exhibited in the National Arsenal Museum in Kathmandu, Nepal. The blade measures 18” long and has a wooden handle thus the definite name. The shape resembles the “BhojPure” version; fat, thick and heavy. Brass fixtures are fitted in the handle to give a dashing look. The normal buffalo hide leather scabbard also has a protecting brass chape to give an overall matching look. 18” Wooden khukuri also comes with two accompanying knives in a considerable size, about 4 inches bladed; a good usable size. 18” wooden is also a good utility knife where heavy duty work of cutting is required. It works like a Machete; a perfect knife for hacking, chopping, clearing motherly things not possible from small or standard sized kukri knives. 18” Wooden’s wooden handle gives a traditional look. It also gives a strong and sturdy grip needed to execute big acts. This one is a semi-custom 18" WOODEN DRAGON and i am truly gob-smacked by what arrived today. even though i knew what to expect in size and weight i was still in awe when holding this masterpiece. 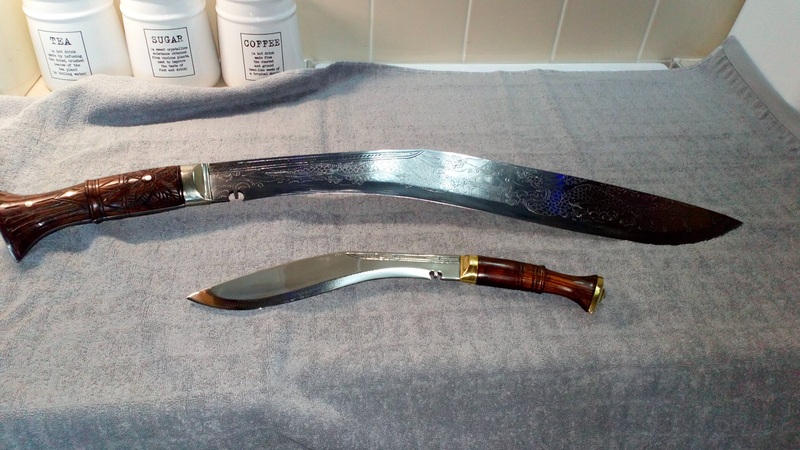 I already had a very large "tourist" khukuri and needed to replace it with the real deal. 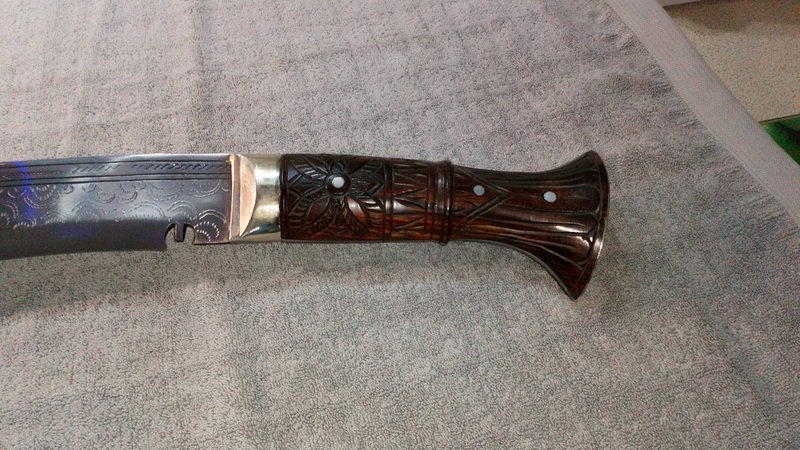 I opted for a 23.5" blade with metal finishing and dark wood for the handle to highlight the beautiful carving created. for the rest of the personal touch., no utility knives or dap was ordered as this is just a showpiece really.